Two Catholic churches designated over archdiocese opposition. On June 28, 2016, the Landmarks Preservation Commission voted to designate four Manhattan properties as individual City landmarks. Three of the items had been added to Landmarks calendar before 2010 and were addressed as part of the Commission’s backlog initiative. Among the backlog items voted on were St. Paul’s Roman Catholic Church, School, and Rectory, at 121 East 117th Street and St. Joseph of the Holy Family Roman Catholic Church at 401 West 125th Street . At the hearing on November 12, 2015, Joseph Rosenberg, of the Catholic Archdioceses of New York, testified that Landmark designation would constitute an untenable burden on the churches and their missions. 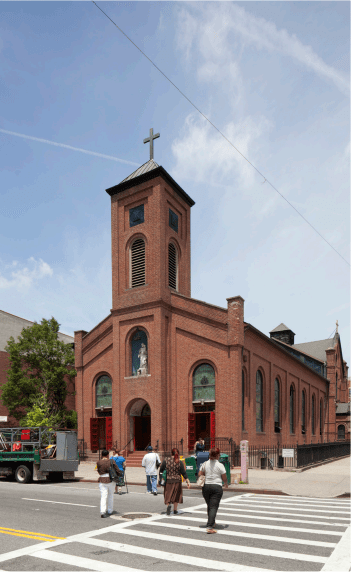 Landmarks elected to designate only the church at the St. Paul’s site, leaving the rectory, school and playground outside of Commission oversight. Chair Meenakshi Srinivasan called the 1908 Romanesque Revival church a “classic building” eminently worthy of designation. Srinivasan added that Landmarks staff would continue to evaluate East Harlem for designation worthy properties. The Rundbogenstil St. Joseph’s was built in 1860 to serve the then-predominantly German-American community of the neighborhood. Landmarks staff recommended that the designation be amended to include only the footprint of the church, not the entire lot on which it sits. Commissioners Michael Goldblum and Michael Devonshire expressed concern about the modifications, especially that adjoining portions of the lot could be developed and that the church would no longer be visible in the round. Chair Srinivasan responded that the designation of religious institutions was challenging, and the modifications were made “trying to come up with boundaries that are rational, that can be supported” and are similar to other designations. The former Firehouse Engine Company 29, at 160 Chambers Street, was originally built as a private residence in 1833. In 1868, it was raised from three to five stories, and converted into a police precinct house. It later served as hospital. The Fire Department occupied the building from 1897 to 1947. Since the mid-1980s, the structure has hosted commercial use at the ground floor, with residential use of the upper stories. It is one of the City’s earliest surviving police stations. Chair Srinivasan pointed to the building’s history of adaptive reuse as one of the compelling facets of its significance. Commissioners voted unanimously to designate the four buildings. LPC: St. Paul’s Roman Catholic Church, 121 East 117th Street, Manhattan (LP-0291); St. Joseph of the holy Family Roman Catholic Church, 401 West 125th Street, Manhattan (LP-0303); 315 Broadway Building, 315 Broadway, Manhattan (LP-1756); Firehouse Engine Company 29, 160 Chambers Street, Manhattan (LP-2564) (June 28, 2016).